Hotel Hochfirst. With real added value. Get to know and enjoy. You are open for discoveries in the enchanting Southern Black Forest? You are looking forward to distant views – over tree tops and the ranges of the Black Forest, staying in the middle of nature, yet never too far away from many charming excursion destinations? Or are you in search for relaxation or are prefering to be active and sporty? For either of the above aspects we are offering a refined atmosphere, good value and services and a range of pleasurable offers, from which you can choose from. Come and meet us at the Hotel Hochfirst garni, idealy with one of our offers. We are looking forward to welcome you! You would like to get most out of the unique holiday-paradise in the heart of the Black Forest. In order to attain a perfect day, we recommend travelling the previous day to the Hotel Hochfirst and enjoying a quiet and relaxing night here. After a savoury breakfast you can reach the BADEPARADIES SCHWARZWALD from our place by car or by direct bus in just ten minutes. 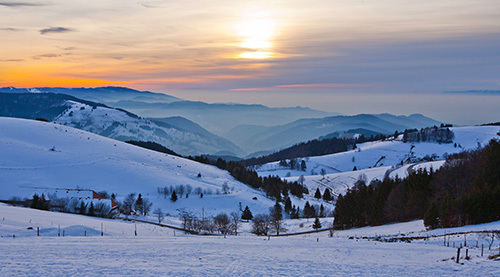 From a stay of 2 nights at Hotel Hochfirst you benefit from the Hochschwarzwald Card. The first 1.5 hours in the Palm Oasis and GALAXY are for free! If you extend your bath visit, you pay only a small surcharge. Even if you book only 1 night, you take advantage from our cooperation with the BADEPARADIES with a discount. You don’t want to run on it. Rather, you are interested in the special places, paths and views that only the local people know – such as the “Zweribach“ waterfalls, the “Balzer Herrgott“ tree or the “Krunkelbach“ mountain hut. We supply the things you need to feel safe on your ramble: We suggest you a suitable hiking tour according to your wishes and your fitness, we help you with a map of walks, and we are always there for a good advice. For winter savourers and active snow enthusiasts. Splendidly, the snow creaks under the boots, the fir trees look like covered with white sugar. Your breath conjures imaginative clouds into the air. After skiing, winter hiking or a relaxing spa experience in the Badeparadies Schwarzwald, you may stop by a mountain inn, where you’ll be spoiled with regional products. For all of this, our hotel Hochfirst will be your second home, where you can warm up at the tiled stove, sleep peacefully and have a hearty breakfast to fortify yourself for a new winter adventure. You are free to take your personal time off, whenever you decide. If so, we recommend our savings weeks. You will enjoy your stay with everything included – at a time when we can offer you a particularly favorable service: during low season*) . You can save money without missing anything. *) available from March till mid-May and in October. On the road with a mountain bike, your private tour guide will take you safely to the most beautiful places in the Black Forest. How about a tour to the Hochfirst summit, or the small waters Mathisleweiher and Feldsee? Or do you have your own plans? 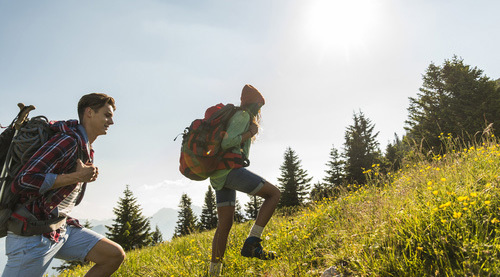 Our trail expert has insider tips that he likes to share with you. He knows the most beautiful scenic outposts, typical inns to have a break and much more. With much experience he plans the tour according to your individual wishes and possibilities. And if you feel like it, he will teach you driving technique and safety. 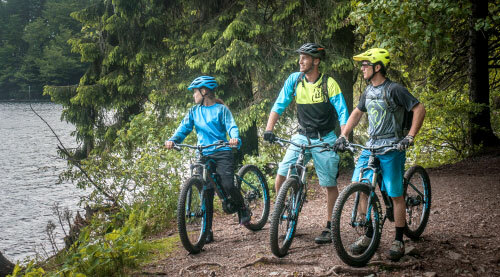 The latest trend: full-suspension e-mountain bikes, because a battery increases the range of your bike considerably. By arrangement, these bikes can be rented for an additional fee. Please reserve in time! We will gladly arrange the contact and inform you about possible tours and prices. You would like to gift someone who already has everything. It should be something personal that may have an enduring impression. We will provide you with an individual voucher, which will meet the occasion and which you will be happy to give away. The best way to get your travel companion, because together everything is twice as fun. For people who value something special. Freely select the amount or the value.